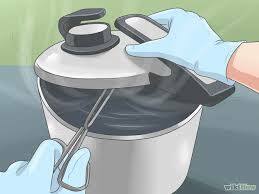 Sterilization is killing and removing all microorganisms and bacterial spores (and prion proteins) to prevent spoilage and infection. It happens by heating (in steam, flame) for some time at a very high temperature. "Keep sterilized men last longer?" Disinfecting or sanitizing is killing most, but not all microorganisms. Alcohol (70%), hydrochloric acid, acetic acid etc. help in this. Hygiene concerns all actions to maintain yourself and your environment clean and healthy by keeping pathogens off. The word comes from the Greek goddess of health and cleanliness Hygieia. The skin is our largest organ. She measures about two square meter and weighs one-sixth of our body weight. It is contaminated by dust mixed with sebum, sweat and dander, causing the skin functions and especially the breathing be hindered. This contaminant layer is also a breeding ground for microorganisms. Clogged pores can infect. A person loses 40,000 skin flakes per day (or 10 grams).Therefore, we must cleanse the skin regularly, especially where skin surfaces touch each other and where we sweat a lot. Also wash your ears (ear wax plugs) and intimate spots well. Do not use too much soap. After well washing rinse (cold) and dry. Washing scraps off the upper layer and can lead to dry skin, which can break and is vulnerable to infections and diseases. The hygiene hypothesis is a possible explanation for the sharp increase of include eczema, asthma and allergies in the industrialized world. The hypothesis says that the human immune system has to work less hard by the improved hygiene and elimination of childhood diseases, and therefore is less efficient. Allergic diseases are less common in children who grow up in large families and / or are exposed to more sources of infection. The mass of bacteria on your skin, live and die, come and go naturally. It is an ecosystem that keeps you healthy. Occasionally washing is OK. Every day is not necessary. Certainly not with soap. Definitely not for your hair and scalp. Washing seems especially socially desirable, not to generate others (with dirt or odors). Of course if you're dirty or unreliable swam in open water. Well wash teeth (2x/day) and (often) hands. Food that fell to the ground is not necessarily unusable. Often a (three or) five seconds rule is held. If you pick it up quickly, it is within that short time not significantly contaminated. Of course, that also depends on the type of food, moisture, surface etc. Especially when preparing food you should wash your hands frequently. Also after using the toilet. Also, keep your nails short and clean.